The Icelandic highland is a vast area in Iceland and a large portion of the island. It is the inland area mostly above the altitude of 500 meters. There are many interesting places in the Highland, natural wonders, hiking trails, and roads. The whole area, without exception, is highly sensitive and requires caution from everyone traveling in the Highland. It is also the part of Iceland that is only open for three months from the middle of June until the middle of September. During the other nine months, the Highland is more or less packed with snow and only accessible to people with extensive training, preparation, and knowledge. For anyone else, during those nine months, it is a dangerous place as severe snow storms can dominate the Highland for days and weeks. Depending on many factors such as the amount of snow during winter the opening of the Highland may vary from one year to the next. Sometimes the Highland doesn't open until the beginning of July. The opening of the main tracks and roads may also vary. Before you start your Kjölur drive you should look into the conditions and opening on the Icelandic road and coastal administrations webpage. Because of the altitude, the highland is almost never a warm place although the weather is often relatively mild during the months of June and July. It is a harsh environment but has many fascinating attractions. For hikers and photographers, it is a goldmine. For those who are interested in visiting the Highland in Iceland taking a road trip on one of the main highland roads Kjölur or Kjalvegur road is probably the best option. Kjalvegur takes you to many interesting places and also gives you a good idea of what the Highland looks like. It is the highland road that usually opens first and has interesting attractions and natural wonders to view and experience. The road Kjalvegur is not a convenient or well-maintained road. It is a harsh gravel road. On the other hand, it is better than most other highland roads and does not have a river you need to cross. 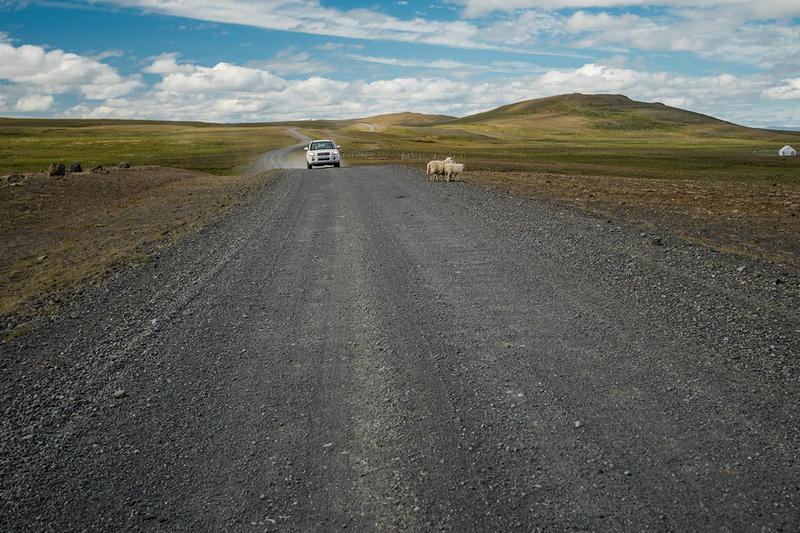 All highland roads in Iceland have always been considered roads for 4WD vehicles or Jeeps. Ever since Icelanders started to enter the Highland in vehicles very few have even given it a thought to enter the Highland in an ordinary family car. Anyone planning a trip to on a highland road should do the same when selecting a car. 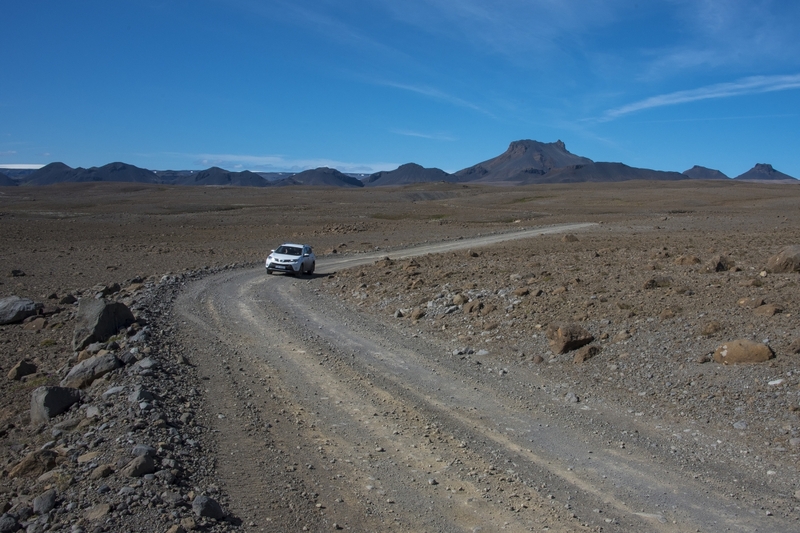 Even though the Kjölur road has improved over the years, a mid-size 4WD car is recommended and preferably a Jeep. For anyone who wants to take the loops, we suggest in this article, should take this advice. Forcing a small car over this road is probably going to take the enjoyment out of the road trip and puts the car at risk. What will you see by driving Kjalvegur road and how long does it take? 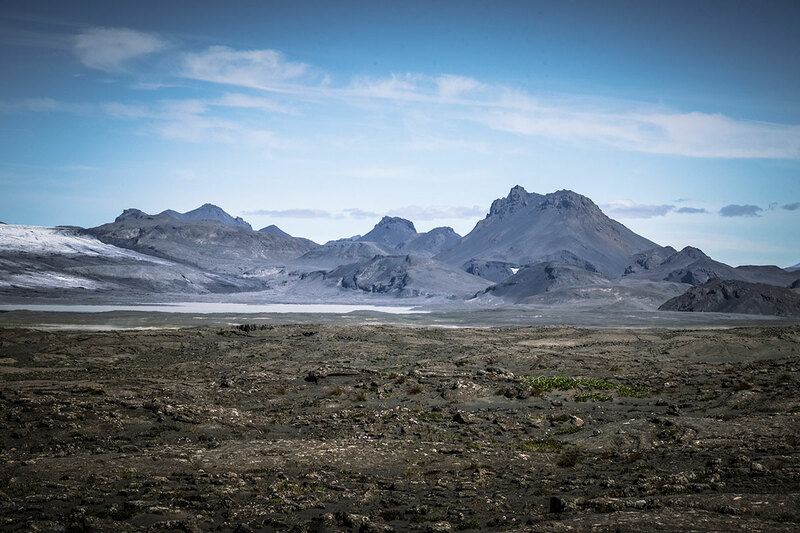 The Icelandic highland is a vast area with mountains, glaciers, lakes, waterfalls, hot springs, colorful rhyolite mountains, countless rivers and more. It does not draw its beauty from colorful vegetation but more from black sands, unusual geological formations and magnificent views. It is remote and exotic with many peaceful sanctuaries. 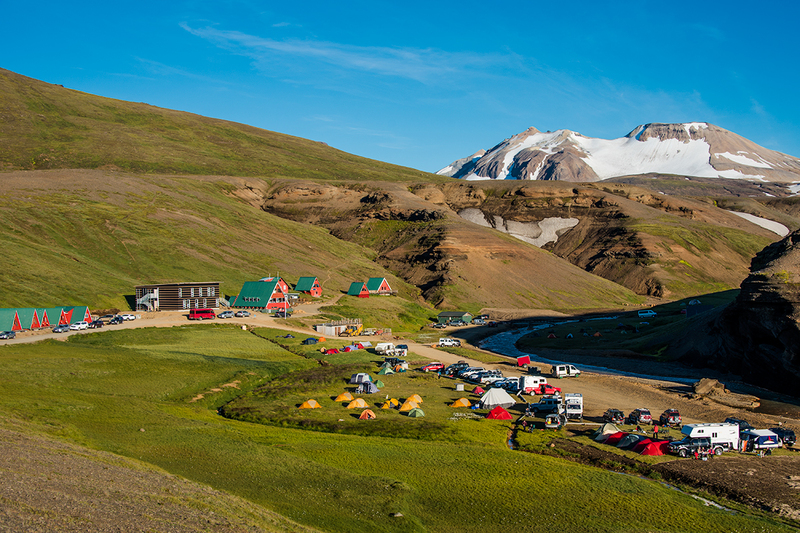 Kjalvegur drive is a combination of an amazing scenic drive and visits to exciting attractions. The drive takes two days as we recommend camping for one night. It is not a long drive, only about 170 kilometers from Gullfoss waterfall to the Ring Road intersection in the Northern Region. It is our preference to drive from the south to the north. It is probably more common for no other reason than most Icelanders live in the south and start their drive from home. 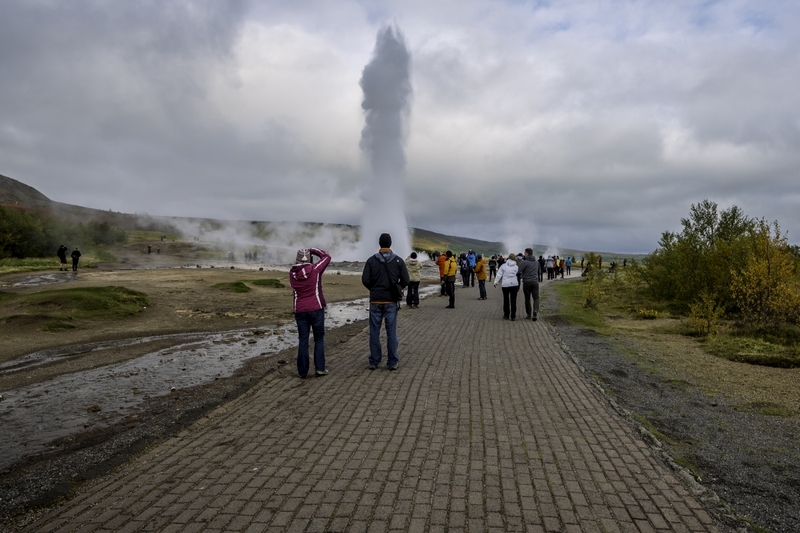 If you are in Reykjavík, it best to drive to Geysir and Gullfoss waterfall and start your road trip. 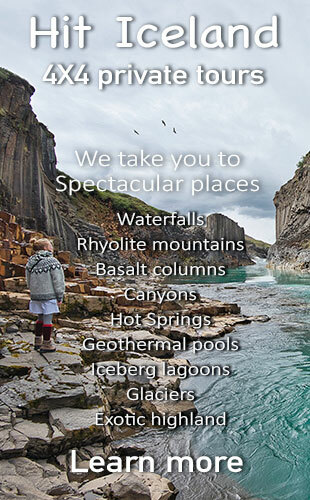 And you should visit those magnificent natural wonders. Two of the most popular in Iceland. At Gullfoss, you continue on Road Nr. 35 and drive north. You quickly notice that you are entering a remote area and different terrain. Although the first kilometers are an asphalt road, the rest is a rather rough gravel road. Just as you drive over the bridge on the river Sandá, you take a turn to the west on the mountain road Nr. F335 Hagavantsvegur. 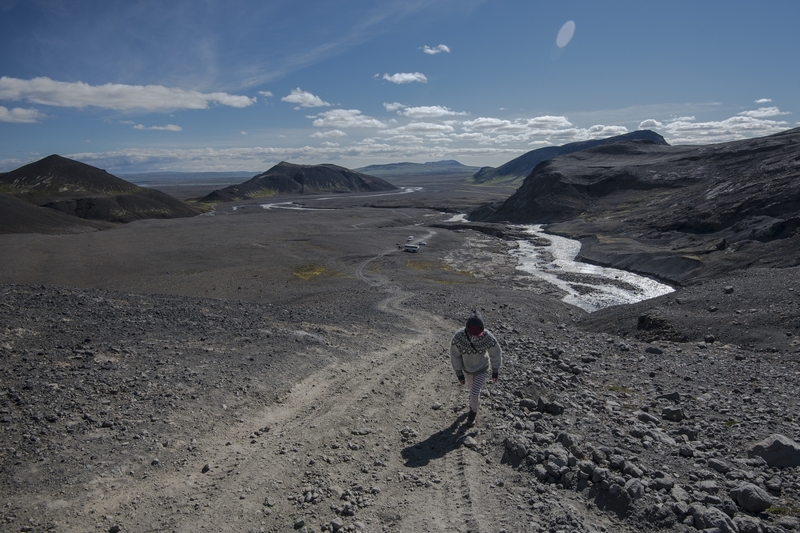 This road is much rougher than Kjalvegur road and is at the end, by the lake Hagavatn and the waterfall Nýifoss, almost a difficult dirt road. It is a road that is under no circumstances for small cars. The whole area by Hagavant and the Waterfall Nýifoss with Langjökulll glacier and the mountain ridge Jarlhettur in the background is spectacular. But different compared to most places you visit in Iceland, as it is a harsh, gray and cold environment. The lake colored by the water flowing from under the glacier and the river and waterfall have this unclean feeling because of all the dirt and clay the stream is carrying. After you drive back and when you are again on Road Nr. 35 you continue deeper into the Highland. When you pass the bridge on the river Hvítá, you should take a turn to Hvítárvatn. A good place to stop and view the glacier Langjökul and the lake. Like Hagavatn this is a lake or a lagoon by the glacier. It is different than Jökulsárlón and Fjallsárlón that there are no icebergs that fall into the lake. 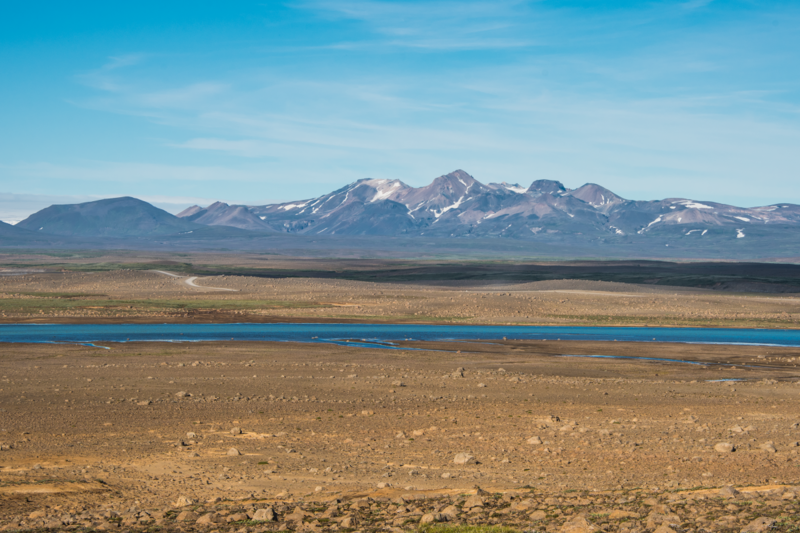 As you continue your drive, you will notice the mountain ridge on your right, Kerlingafjöll. This is your next destination. After approximately 16 kilometers drive farther into the Highland you take a turn east on Road Nr. F347. A few minutes and four kilometers drive you come to the waterfall Gýgjarfoss. This is one of many spectacular waterfalls in the Highland in Iceland although few are big tourist attractions. This location is also interesting in the sense that you are now between two glaciers, Langjökull in the west and Hofsjökull in the east. The whole scenery is magnificent but very different to most places. It is not as colorful as the lowland and not as warm. From Gýgjarfoss you continue to Ásgarður the camping site in Kerlingarfjoll. It is ideal for camping. Here it is recommended to take an afternoon or evening walk to the geothermal pool only a few hundred meters from the camping site. The next day you begin the day by driving the short distance to Hveradalir hot spring area. The drive and the road is a bit steep and leads you up to approximately 1000 meters in altitude. Here you need a 4WD for better traction and security. The short drive is spectacular passing a beautiful canyon and enjoying a magnificent scenery of mountains and glaciers. Ones you have parked your vehicle you can take a walk into one of the most beautiful wonderlands in Icelandic nature. If there is one place that is actually exotic in Icelandic nature, it is Hveradalir and this you will understand and feel when you have walked down the steps and stand in the middle of this unique place of color, steam and boiling clay. We recommend that you spend two to three hours here and walk the many paths and steps to view the many small wonders in the area. It is not a place you want to rush through. From Hveradalir and Kerlingafjöll you drive the same way back to Road 35 and continue your road trip north. The next stop is Hveravellir approximately 30 kilometers drive. The scenery is a typical harsh highland scenery of gray sands, mountains with almost no vegetation and glaciers. Halfway to Hveravellir, you will pass a sign, Beinahóll or Bonehill. The drive to the hill is very slow and only for good jeeps. The hill is part of one of the most chilling and famous stories in Icelandic history, the story of the brothers from the farm Reynisstaðir in Skagafjordur fjord and their travels over this road in the 18th century. Once you reach Hveradalir, you are in for a treat. 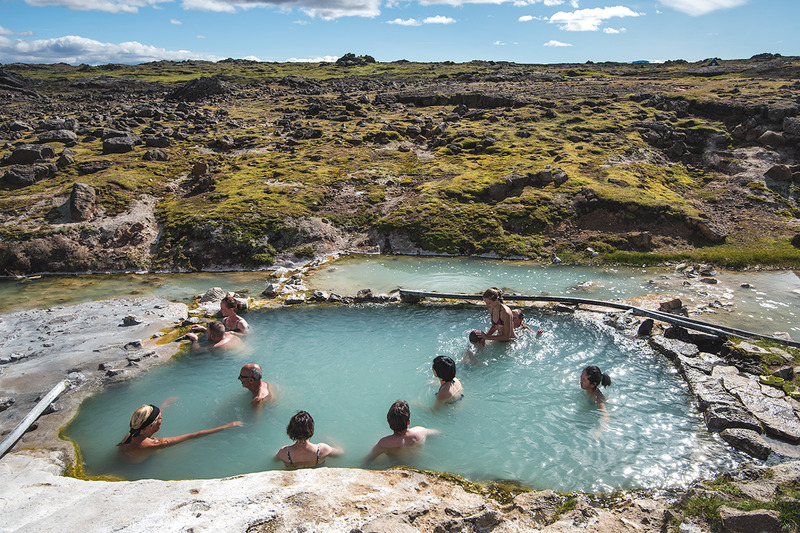 Here you can dive into one of the most famous geothermal pools in the Highland and also take the time to view and admire the many highly interesting hot springs. And dont forget the "home" of the outlaw Eyvindur and his wife Halla. 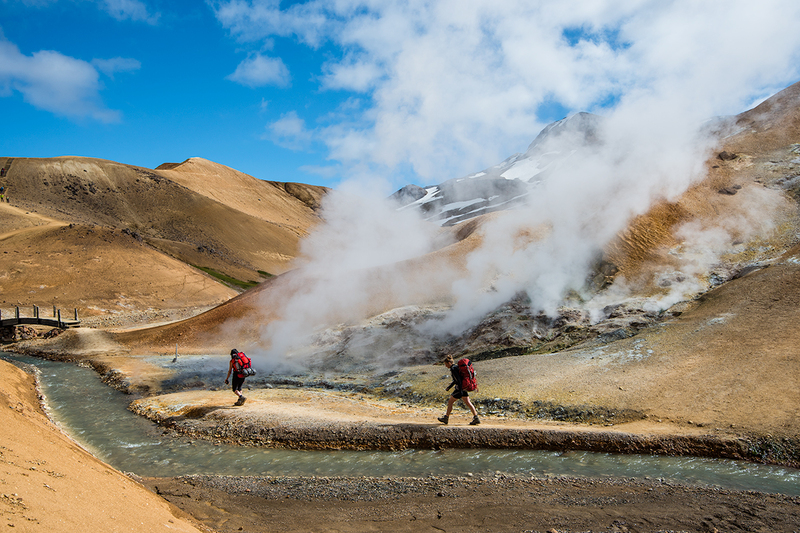 There are fine walking paths around the area and many really interesting hot springs. The drive from Hveravellir to the intersection on the Ring Road Nr. 1 in the northern part is about 90 kilometers. Contrary to the southern part it has more vegetation and as you approach the Ring Road is you drive through a moorse, in accordance with the name of this area, Auðkúluheiði. This is not a particularly interesting area nor does it have any particular attractions. Half way through the road you pass a large lagoon or a lake, the 5 square kilometer Blöndulón. This is actually a reservoir for the hydroelectric power plant Blönduvikrjun. As you continue, you will also see some other small constructions related to the power plant and before you start your descent down to the beautiful valley Blöndudalur you drive by the actual Blanda Power Station. If the Power Station is open, you can go in for a tour and take the highest lift in Iceland 270 meters down to the three turbines that produce 150 KW of electricity. From the Power Station, you drive through Blöndudalur valley to the Ring Road Nr. 1.